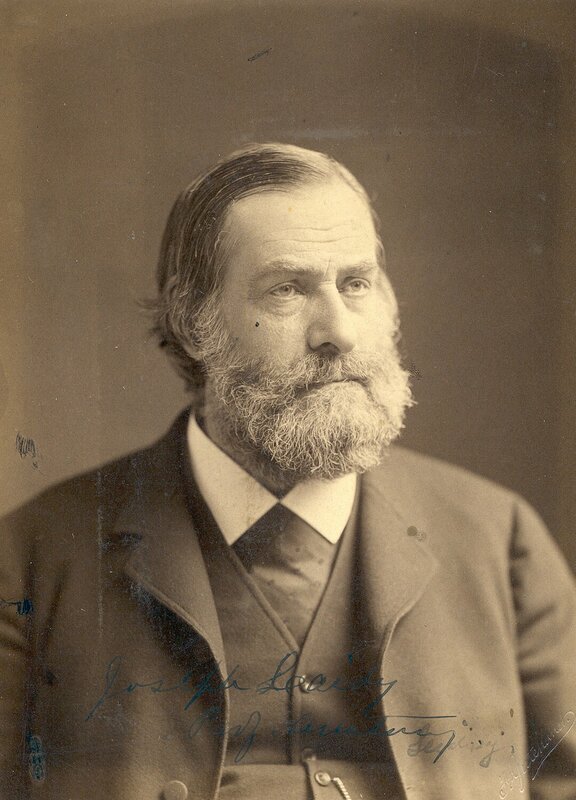 Penn’s Medical School showed its commitment to modern science and research by hiring Joseph Leidy in 1853. An 1844 Penn medical graduate, Joseph Leidy had different interests and aspirations than many of his classmates. Leidy gave up his private practice in 1846 and joined the faculty of Franklin Medical College. A pupil and prodigy of George B. Wood, Samuel Jackson, William Horner, and Paul Goddard, Leidy had an immense interest in modern science and research. Well trained in microscopy, Leidy, at the age of twenty-three, successfully identified the parasite Trichina spiralis. By the age of 30, Leidy “was already recognized at home and in Europe as the country’s foremost comparative anatomist.” When Dr. William Horner died in 1853, Leidy applied for the chair of anatomy at Penn’s Medical School. Leidy had an established reputation and relationship with Penn but “opponents protested that he was not practicing medicine and that he was devoting too much time to scientific research.” Penn’s new emphasis on investigation and modern science made Leidy a perfect fit for the Faculty. In his anatomy course, Dr. Leidy’s students learned about cells, tissues, parasites, and microscopy. Leidy tells his students in 1857, “All bodies higher than these present ‘organic cells or Elements derived from their transformations’: this organic cell is the Archetype of structure.” Dr. Leidy explains that the cell, a structure invisible to the naked eye, is the foundation of anatomy. Outside the classroom, Leidy established himself in the academic communities of Philadelphia, America, and Europe. He joined the Academy of Natural Sciences and the American Philosophical Society, and befriended English scientists Richard Own and William Henry Harvey. Joseph Leidy immediately enhanced the prestige of Penn’s Medical School through his activities as an educator and a researcher.